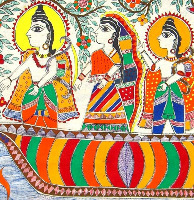 Madhubani, or Mithila, painting is a folk painting of northern India. It is mostly practiced by women in the villages who have passed this art to their daughters through multiple generations. They paint pictures of nature and mythology to depict different events like birth, marriage, and cycles of life. Though this folk art has been practiced for centuries it started to gain national recognition only in the last few decades. Now, art patrons can find Madhubani artists in several cities of northern India, many of whom are experimenting and adapting the traditional styles to modern ethos and medium. The area of Mithila lies near the border of India and Nepal and carries a rich pastel of cultural legacy in art and literature. Its heritage goes back at least 2,500 years and its celebrated figures include the Buddha and Mahavira. It is also the birthplace of Sita, the central character in Ramayana. Hence, her life stories are frequently depicted in the local art. The paintings are traditionally based on mythological, folk themes and pastoral symbols. The central themes of most paintings are love, valor, devotion and fertility, though the approach may vary. So it is common to find scenes of courtship and marriages and symbols of fertility and prosperity like fish, parrot, elephant, turtle, sun, moon, bamboo tree, lotus, etc. in prominence. The divine beings are positioned centrally in the frame while their consorts and floral motifs form the background. The human figures are mostly abstract and linear in form. Even though this art is centuries old, it has preserved its original style and content in its native land of Mithila. Nowadays synthetic colors are used but traditional artists still make their own colors by extracting them from plants. The coloring is of two styles – Kachni (hatching) and Bharni (shading.) Kachni uses delicate fine lines to fill the painting and not much color is used. Bharni (shading) uses solid colors to shade and fill the pictures. It uses black outlines filled with vibrant colors. A variety of inventive patterns are made with hatching and stippling. Even now during birth and marriage ceremonies paintings are made on walls with different symbols like bamboo (lineage,) lotus, and fish. The designs announce the occasion of the celebration and solicit good fortune and divine blessings.